Delicious blueberries. They're cheap around this time of year, so you'd might as well enjoy 'em. It’s blueberry season, in case you haven’t noticed. 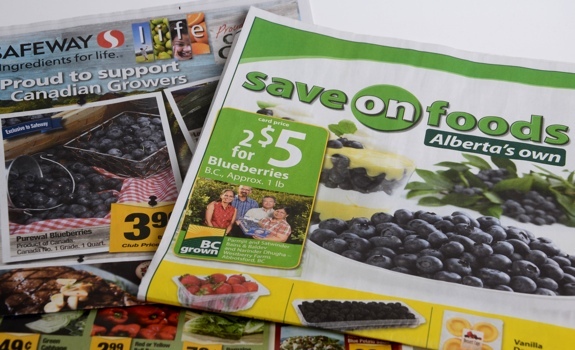 The grocery store flyers are starting to arrive on Edmonton doorsteps, announcing spectacular deals on massive quantities of blueberries. They look so tempting, and they’re so stupidly cheap – how could you possibly say no? But you’ve done this before, haven’t you? You bought a five-pound case of blueberries with the best of intentions, then found yourself out of ideas with half the case left. You felt terrible when you threw them out. So before springing money on a large quantity of blueberries this year, why not make a plan before you make the trek to the market? Here’s a helpful list that I compiled as much for my own use as for the use of the rest of the internet. 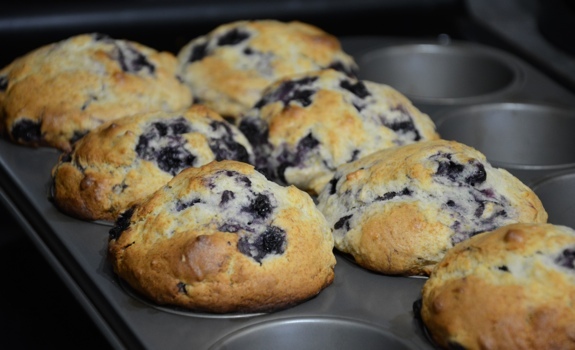 There are an infinite number of blueberry muffin recipes online, but my personal favourite comes from the now out of print Company’s Coming Muffins and More cookbook, which I’ve since modified into a recipe for lemon blueberry muffins. If you want to jazz up your own blueberry muffin recipe, try adding the zest from half a lemon, and maybe a couple tablespoons of lemon juice. The amount will depend on the size of your batch and how lemony you want your muffins to be. If you add lemon juice, make sure there’s enough sugar to balance out the sourness. A batch of my lemon blueberry muffins, fresh from the oven. They look good, but they taste even better. There’s no better breakfast on a sunny Saturday morning, preferably topped with butter and real maple syrup. And what’s this? NEAROF!’s favourite blueberry pancake recipe? You’re welcome. This is a bit more involved, but you’re rewarded with a warm, freshly baked blueberry pie. I’ve never actually made a homemade blueberry pie, but I keep telling myself I will. Links to your favourite recipes would be appreciated. Here’s a stupidly easy recipe for blueberry sauce that looks perfect for pouring over various desserts. Ice cream, cheesecake, shortcake, etc. Sure, you can buy a blueberry smoothie in a bottle, but why not make one from scratch while the berries are cheap, fresh and plentiful? Here’s a recipe from the B.C. Blueberry Council. Remember Starbucks’ blueberry oat squares? Try making something similar at home. There’s a recipe over at Canadian Living that looks good. Blueberries coated in icing sugar, just before they were added to a batch of blueberry pancakes. It’s basic, but it doesn’t get any simpler. Add a handful to a bowl of yogurt or breakfast cereal, and enjoy the flavour boost. I was given a Cuisinart ice cream maker a year or two ago, but my old apartment’s freezer had neither the room nor the freezing power to be able to deal with the freezing cylinder. But now that I’ve got a decent freezer, I’m eager to give ice cream making a try. And what could be a better first batch than blueberry ice cream? I plan to give this recipe a whirl before the end of the summer. I’m guessing you’ll want to keep this stuff away from kids wherever carpets or stain-prone clothing can be found. At some point, you may have to admit defeat and freeze the rest of your blueberries before they go bad. Here’s a guide to doing just that from Pickyourown.org. Like when freezing many other types of berries, the key is to not just dump them all into a bag and jam it in the freezer; unless you freeze them in a single layer, you’ll end up with a solid lump of berries. Deals, deals, deals. Keep your eyes open for cheap, cheap prices on cases of blueberries. If you’re looking for even more ideas, there’s a nice batch of recipes over at Canadian Living, and even more at the B.C. Blueberry Council website. How about you? 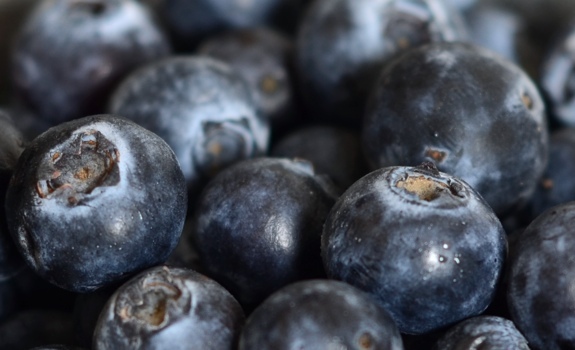 What are your favourite uses for fresh blueberries? Share your ideas in the comments, eh? Kids and grandkids love blueberries just as they are. So do I , but even better in a bowl with milk over them and sprinkled with sugar. In the old days we used to put fresh cream on berries. That was even more delicious and no-one ever mentioned that it could be bad for your health! We enjoyed our food with no twinges of guilt or anxiety. And of course cornflakes or other cerial or granola go very well under blueberries. 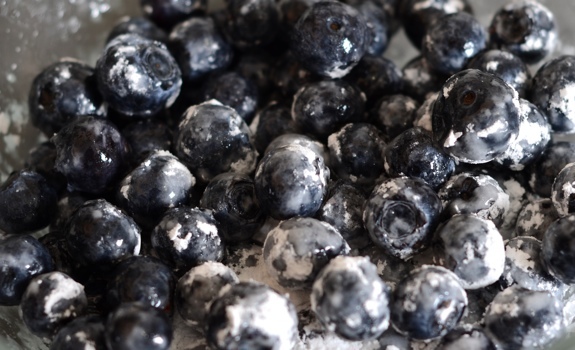 Frozen berries are good to eat right out of the freezer if just a few, or partially thawed if more of them. Frozen pitted cherries are best after being out of the freezer 1-2 hours. Great to put out for a snack for company in the winter.